Lois and Edna (?) are taking a bag of bagels to Edna's aunt when they are attacked by... flying robot monkeys? Okay, they're called M.O.N.Q.U.I.S. Some ugly monster-looking guy named Professor Ivo is talking with a man and a woman who are his "employers", and says a girl who was on the tram with Lois and Edna (Charlize Yue) is a physics prodigy and a virtuoso violinist. 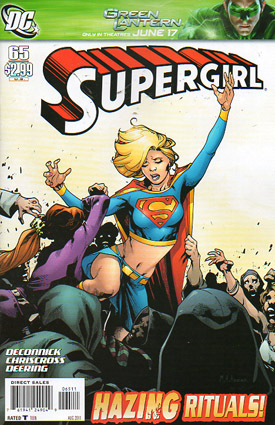 Supergirl shows up to defeat the M.O.N.Q.U.I.S (I can't believe I'm typing this), along with Starman. Edna seems traumatized and keeps saying "going to seed". Kara and Starman talk about feeling like outsiders and fly off to find more bad guys to fight. At the Daily Planet, Lois talks to Linda and apologizes for her bad jokes, which Kara doesn't get for some reason, and then asks for a favor. At Stanhope College, Lois gets Kara to try to find information on Charlize from her classmates. Kara feels she's not up to the task, but Lois says four other kids similar to Charlize (prodigies with no family) have disappeared and wants to investigate. Kara thinks Lois wanted her help because her parents are dead, but Lois says Kara's uptight and she just wanted her to hang out with kids her own age and cut loose for a weekend. By... investigating a girl? Sounds like a party. On a tour of the campus, Kara meets Henry Flyte from the Silk Pajama Society who's singing a song about Charlize, but it turns out it was written 200 years ago. In her room for the night, Henry taps on her window and wants to recite a poem back and forth, but Kara won't play along. Her roommate does, though, and leaps from the second-story window and lands unharmed. Kara checks on her but she seems to be fine, and Henry says if they go with him he'll tell them about Charlize and who's next, which happens to be... him. But he wants to be abducted so he can find out what's going on, and then he disappears. Story - 2: A fresh start, a new writer, and what do we get? Professor Ivo and M.O.N.Q.U.I.S.?! This is the kind of stuff that prevents comics from being taken seriously in some circles. You just can't do stuff like that unless it's tongue-in-cheek, and here... it's really not. It's clear the tone is supposed to be lighter and more fun, which I can get behind, but when you layer missing students over that it seems like the "mystery" is much too grave for the tone. Should we not worry about these kids and instead laugh at the annoying antics of Henry? Or should we ignore Henry's annoying antics and be more concerned for the kids? They're kind of at odds with each other. I also don't get Kara not understanding simple jokes from Lois... once, sure, if you're distracted, but twice makes it feel like Kara must be brand-new to Earth and not used to humor, much less not familiar with Lois. That didn't really work for me. Neither did the conversation in the car, where Kara accuses Lois of wanting help only because her parents are dead, and Lois said she just wants Kara to cut loose and have fun with kids her age... while investigating missing people?! If you're wondering what the hell kind of sense that makes, then I think you have a good sense of logic about you. Why this issue does not share that same sense of logic, however, has left me puzzled and curious. I'm not sure why the Starman was in this book, he served no purpose at all and just disappeared. Perhaps he'll come back later on, but if not then... there's no point to him being here at all. Overall it just felt kind of like a mess, sadly. For as much as I'd like to see Kara in college and with a life of her own as an ongoing storyline, this just isn't it. Art - 1: I... I don't even know what to say. Faces change routinely from panel to panel, and the same person seems to have a face based on a different *real* person depending on the angle their head is turned. Wonkiness abounds everywhere you look. Look at Lois in the bottom three panels on page 8... every single panel she looks entirely different, and in each one she looks like she's been hit in the face with a different frying pan. On page 9 Kara is suddenly 50 years old, page 10 Lois and her crazy hand gestures are just... is she casting a spell? Kara again looks 50 here, until you get to the last panel where she's 20. This goes on for the rest of the book. Kara's roommate seems to have about 10 different faces... perhaps that's her superpower? This stuff is just not for me, I'm afraid. It felt very amateurish in a lot of places, and I just didn't enjoy it at all. Cover Art - 2: It's... well, it's okay, but... what the heck does this have to do with anything? At all? What's that, you say? Nothing? Precisely.